Savvy marketers invest in organic search. Improve rankings, increase traffic and get results. That’s where we come in. With decades of experience in digital marketing, a number of awards under our belt and offices in Nottingham and London, our team has helped businesses just like yours to achieve their goals online. 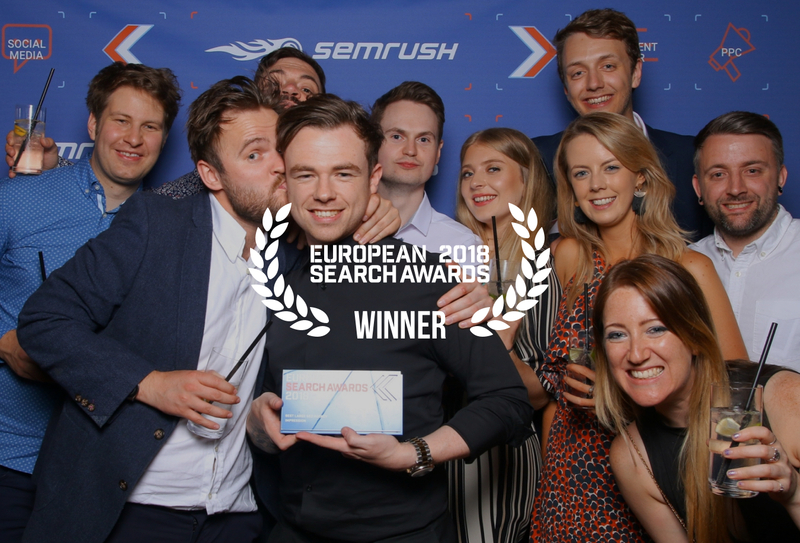 Impression was named the Best Large SEO Agency in Europe at the European Search Awards 2018. The award, which recognises the very best in SEO strategy, creativity, implementation and results, was presented to the team at a ceremony in Prague, beating competition from some highly respected agencies and firmly placing Impression at the forefront of the UK digital scene. Find out more here, or get in touch to find out how we can help you craft award-winning strategies that deliver tangible results for your business. Technical considerations lie at the foundation of SEO success. Achieve technical excellence and reap the rewards. SEO is often referred to as a science, sometimes as an art. In reality, it’s a combination of both, where success is driven by good data and a creative approach. Our approach is very much rooted in our value of providing ethical SEO that delivers long term, tangible results. Of course, SEO must align with your business strategy if you want it to deliver a return on your investment. We believe that the input should reflect the output you want to achieve, and that’s why we invest our time in understanding your business before all else. We research and analyse your business, your audience and your industry so we can better serve your needs. If your website doesn’t work well or deliver a positive user experience, Google will be reluctant to include it in its search results. Our expertise in web development as well as SEO means we are able to comprehensively audit your site from a technical perspective, ensuring everything works as it should and advising on where improvements needs to be made and could be made in future. If your website isn’t relevant to the search query – or more specifically, if Google doesn’t recognise its relevance – it won’t rank. We review your existing content, ensuring that each page has a clear purpose and that your site displays your expertise across your full range of products and services, and support you in the creation of new content to capture the attention of your target audience. It’s one thing to have great content on your site but if no one recognises how great it is, Google will have a hard time recognising it too. Our team comprises SEO, PR and content marketing experts, putting us in a position of real strength when it comes to promoting your website online. We help you get your brand in front of your target audience and build your site’s authority. Your business growth is important and you want to be sure the agency you choose to support that growth is going to deliver the results you deserve. We recognise that we might not be the only agency on your shortlist. But we believe we should be! Here are some of the great reviews left by our SEO clients to tell you a bit more about why they choose us (and why you should too!). We work with clients across the UK and beyond to provide digital marketing services which positively impact their bottom lines. Business of all kinds grow with us, from ecommerce to travel, manufacturing to food. You can see more reviews from our clients over on Reviews.co.uk. In our experience, Impression demonstrated great creativity within an agile delivery environment. With great communication at its base, detailed iterative process and craftsmanship they delivered an excellent outcome. Superb digital agency, straight talking, commercially savvy and eager to develop new initiatives. They keep up to date on all the latest in digital and use this to ensure the client stays ahead of their competition. You don't get long words and 'smoke and mirrors' with Impression, just answers and good results. Innovative and efficient Impression always come up with interesting and relevant solutions. Data analysis capabilities show trends we hadn't thought of. Highly professional and always approachable, excellent at keeping within a tight budget. Detailed knowledge of complex website and structure issues. I cannot recommend Impression enough, they have a can do attitude and nothing is too much trouble. Within 6 months of working with the the team at Impression we are already seeing a great return on our investment. They are true innovators and we are delighted to be partnering with them. What impressed me and the rest of the team was how knowledgeable the team is, but yet able to explain things to the not so knowledgeable trainees, in a way we all understood. Impression are, in my opinion, one of the best digital agencies in the Midlands area. Their team of digital specialists are truly invested in the success of Impression and their clients, making working with them a joy! Their approach to digital strategy is first-class and their in-house knowledge gives me every confidence that there's plenty more to come from the Impression team. Interested in how SEO can help your business grow online? Our team of SEO experts regularly blog about SEO, including algorithm updates, new tools and techniques and things to look out for on your own website. Read our SEO blog posts here. If you have the resource in-house to undertake your SEO and are simply looking for some guidance, we can also help you. We can deliver SEO training either here at our Nottingham city centre office, or we may be able to come to you. Our training is typically delivered in conjunction with a strategic review, where we’ll conduct an audit of your site and use that to inform a strategy which will be laid out for you in a report format. Our training sessions then teach you how to implement that strategy. Find out more about SEO training from Impression. We refer to SEO as a creative science. We believe in the power of data to inform and guide strategies, ensuring everything we do improves the user experience on your site and moves to further in the direction of your goals. We invest in a range of industry leading tools which enable us to analyse your website and user data in much greater detail than many of our competitors. These tools include the full suite of Moz analysis tools, OnPage.org, AHREFs, Screaming Frog, Gorkana, Raven, SEMRush and lots more. As well as these existing tools, we’re in the unique position of having our own dedicated developer working on building our own internal tools, making our work more efficient and meaning we can spend more time getting you the results you deserve. Google is always refining its ranking rules, or algorithms, to help it better understand all of the websites it ranks. Big algorithm updates tend to be widely talked about – including the Panda update, which relates to content quality, the Penguin update, which relates to inbound links, and many more – stay up to date with Google’s updates over on our blog. In extreme cases, particularly if you have invested in an SEO strategy which uses non-ethical techniques (either knowingly or not), websites can be penalised by Google for failing to adhere to ethical techniques. We are able to help you address the issues raised by the penalty and to submit a reconsideration request to Google to get the penalty removed. Find out more about our Google penalty removal service here. Digital PR and SEO work perfectly together because they share a common goal; to improve the authority of your website through relevant, quality features around the web. PPC works really well to support SEO campaigns by improving your search visibility immediately and giving you a place to test new keywords.